Hot Air Balloons, originally uploaded by Lukasmummy. Credits: Up, Up and Away by Laura White (C.W Picket & Company). Font is Pea Mystie Unicase by Amanda Bottoms (Fonts For Peas). 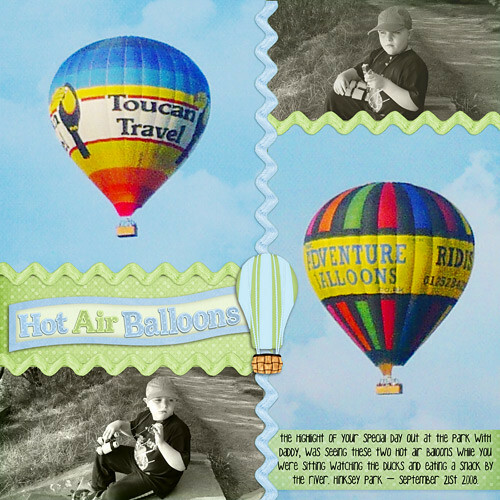 Journalling reads: The highlight of your special day out at the park with Daddy, was seeing these two hot air baloons while you were sitting watching the ducks and eating a snack by the river. Hinksey Park – September 21st 2008. Thomas The Tank Engine, originally uploaded by Lukasmummy. Credits: Layered template (January 8th 2011 Freebie Template) by Connie Prince and Train Time (slightly recoloured) by Jen C Designs. Font is FO Textura by Fontologie. 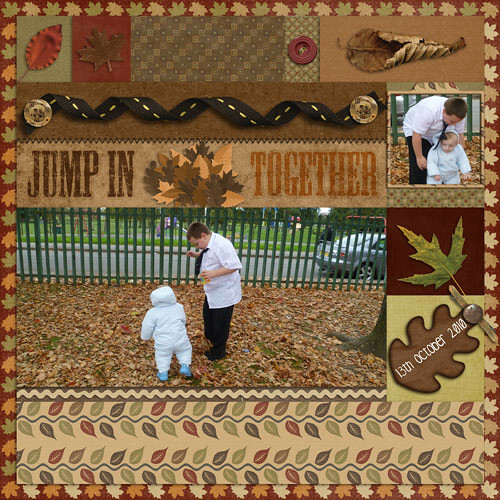 Jump In Leaves Together, originally uploaded by Lukasmummy. Credits: Playing In The Leaves by Jolly Kids Creations By Marie and Autumn Medley by Katie Pertiet. Font is DJB Coffeeshoppe Espresso by Darcy Baldwin. Sweet Dreams Leo, originally uploaded by Lukasmummy. Credits: Layered template (Can Ya Dig It August Template), All About Me Tab Alpha, Walk In The Park and Read With Me all by Laura White (C.W Picket & Company) and Glitter from Hit The Road Jack Mega Kit by Daphadilly Art. Fonts are Park Avenue BT and Pea Angedawn by Amanda Bottoms (Fonts For Peas). Journalling reads: He used to look so innocent when he was laid in the moses basket. He was so tiny that he could lay across it instead of top to bottom like a normal baby. It was a beautiful moses basket, but he didn’t care. He hated it with a passion. The only place he wanted to sleep was wherever my arms were at the time. As long as he got what he wanted he would sleep for hours without making a sound. He was always an angel but never more than when he was dreaming his baby dreams and snoring his sweet little baby snores. Accident Prone Lukas, originally uploaded by Lukasmummy. Credits: Layered template (Can Ya Dig It, July 2010 Template), Not The Doctor and Not The Doctor Alphas all by Laura White (C W Picket & Company). 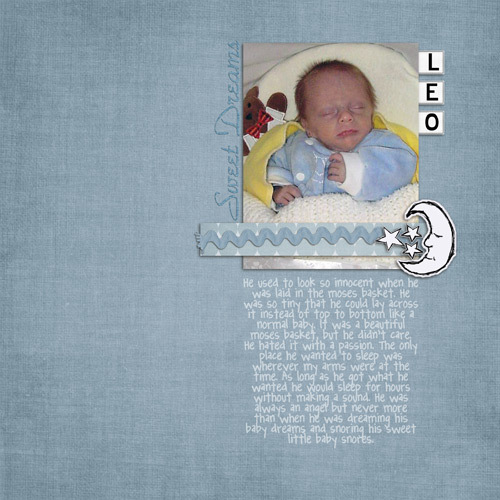 Fonts are GG Basic and FO Howie’s Stamps Lowfat by Fontologie. Journalling reads: There really can’t be all that many children, who are as accident prone as you Lukas. On your first day in year one, you ended up getting a cut above your eye and a nasty graze on your hand. Apparently another little boy had knocked you over. On your second day in year one you got hurt again. We ended up getting a call from the teacher, who told us not to wory but Lukas had a little accident and hurt his head. When we came to pick you up we were not expecting it to be this bad.. We found out it had happened when you fell from the top of the climbing frame what are we going to do with you Lukas?